72th Independence Day was celebrated in the district with great fanfare. Colorful events are presented by flagging the flag at 9 am in the offices of headquarter, tehsil, block and schools and government and non-governmental institutions. On the occasion of Independence Day. 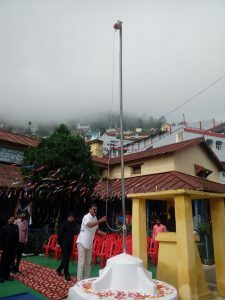 At 9.30 am in the Collectorate premises of the district headquarters, Subodh Uniyal,Chief Guest,hoised the flag, and greeted everyone on Independence Day. District Magistrate Sushil Kumar chaired the program organized in District Collectorate Complex. After the Prabhat ferry, several cultural and colorful programs were presented by students of various schools. Main guest distributed mobile tablets to six girls under the girl’s incentive scheme. 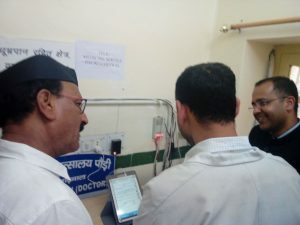 Under the organized program, other dignitaries, including the in-charge minister, commissioner and district collector, duly initiated telemedicine on the initiative of District Administration and Health Department to provide health benefits to the remote rural areas in the district hospital after the plantation campaign. 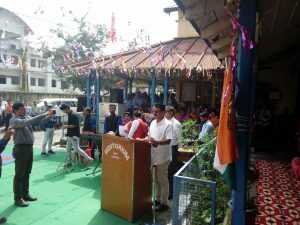 Addressing the program organized in the Collectorate campus, Honorable Minister, Mr. Uniyal said that India has completed 71 years and we are celebrating 72 years of country’s independence. In the same way, 17 years of Uttarakhand state has been completed and it has been progressed in 18th.Recalling the many great men in the country, he said that after Independence, the country is progressed on the path of progress. Said that our country is progressing along with other developed countries of the world. He said that for the integrity and unity of the country, all of us have to be united and work on the progress of the country. Today, the concept of clean India started from Gandhi ji and Modi has brought it home to home .Cleanliness of the house, village and city is creating a healthy and clean India. On this occasion, the in-charge minister counted the achievements of the state government.He asked humanity to work on the basis of paramount importance in the countryside and to do the work. Said that work culture needs to be improved. This will lead to the development of the country. He told the officers that by adopting the three concepts of spirit, lack and influence, they will help to meet the needs of the people. He said that by educating women, the daughter herself will be saved. He said that the government is committed to educating women. In his address, District Magistrate Sushil Kumar said that our freedom fighters have rescued the country from foreigners and internal difficulties. In today’s world our country has emerged as a global country. The country is progressing towards progress in every field. He said that under the work culture, the benefit of those schemes should be met by the person sitting in the last end who needed it most . This is what culture will do for itself. He challenged everyone to unite to maintain the spirit of nationalism. Said that its country is known as the young country in the world. Said that using these youngsters correctly, the country has to move towards a developed country. With the initiative of the district administration, today the launch of the telemedicine Service for providing healthcare in the remote rural areas in the district hospital. The Minister in charge and the Commissioner in charge of health Got information about check-up with the patient from the Ghotala village of Rikhanikhal block, through the android tablet. On this occasion, Garhwal commissioner Shailesh Bagauli said that the district administration and health department have taken this excellent initiative. Health benefits are provided to people of remote rural areas through Tally Medicine. Along with the pharmacists in remote areas, the patients will be able to get the information related to treatment by direct interaction with the doctor. This service will prove beneficial for places where doctors are not available. 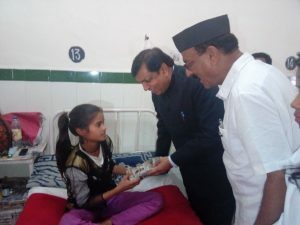 During this, in-charge Minister Shri Uniyal and Commissioner Mr. Bagauli and District Magistrate Sushil Kumar gave fruits to the patients in the hospital. 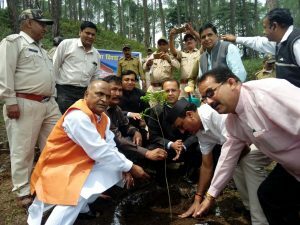 Earlier, on the initiative of Forest Department, plantation campaign under the leadership of Incharge Minister Subodh Uniyal, Garhwal Commissioner Shailesh Bagoli and District Collector Sushil Kumar.They personally signed the signature banner of plantation organized in the celebration of Independence Day and planted plants like pine, Surai, Burans etc.On this occasion Chief Development Officer Dipti Singh, DFO Laxman Singh Rawat, CMO Dr.BS Jagpangi, CMS Dr. RS Rana, Additional District Magistrate Ramji Sharan Sharma, Deputy District Collector Sadar SS Rana, e-District Manager Prakash Chauhan, District Officers and employees of different departments are present. In charge Minister Subodh Uniyal addressing the gathering.